*I’m trying to clean up some of my older posts and reshare a few that were lost in the archives. This one was tweaked just a bit and was originally shared in 2012. 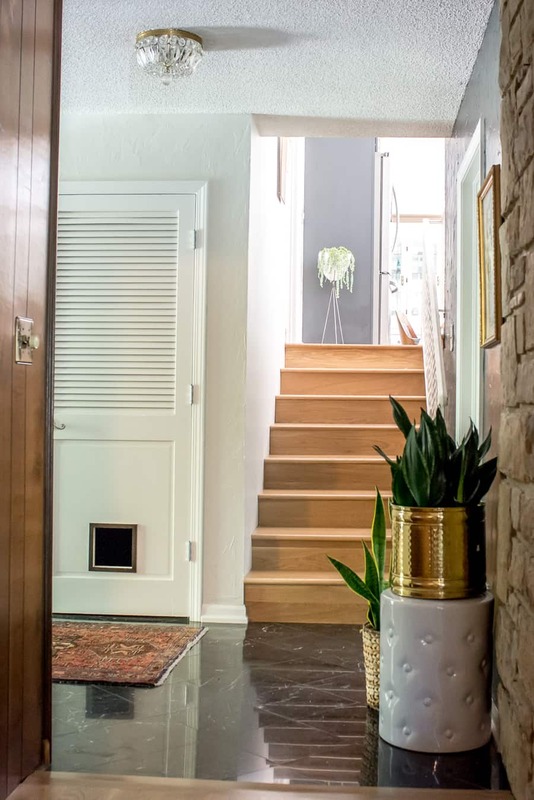 When we first moved in to this house, we couldn’t figure out the best place to put the cat’s litter box. The upstairs was mostly carpeted and the laundry room was small. The best place to have the litter box seemed to be the basement but we had a door that closed to the basement. After looking at cat door ideas and units, I decided that it wouldn’t be too hard to make my own. 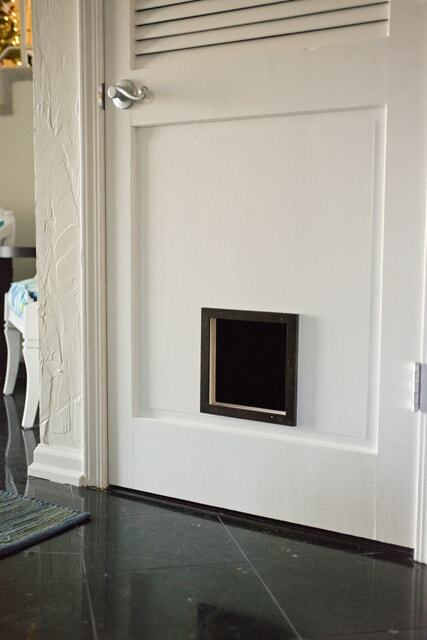 So, here’s a very simple tutorial for a simple DIY Cat Door. First things first, here’s the door that we had. We took the door down, sanded the flaking paint and repainted it. At the same time, I repainted the door casing. The door and the casing were an off-white and just looked a bit dingy. Bright white paint helped so much! My favorite paint for wood is Benjamin Moore Advance and I love having Valspar Ultra White color-matched to BM. 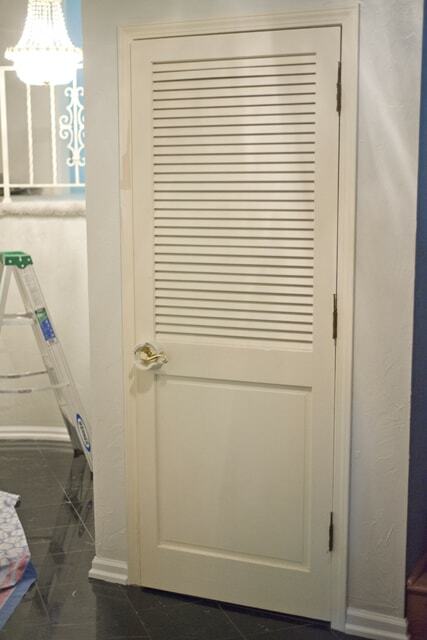 After painting the door, I deglossed, primed and painted the door hardware. 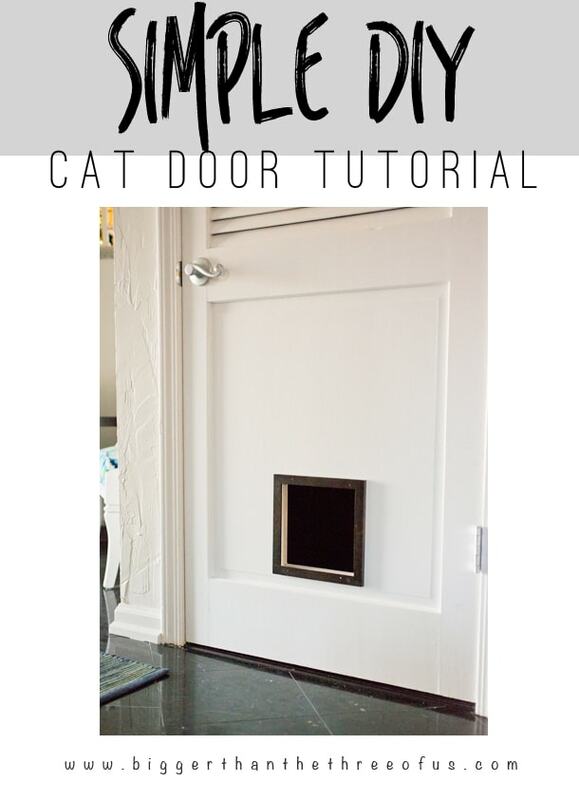 So, onto the how-to for the cat door. I picked up two square picture frames at Hobby Lobby. Using the picture frame as a guide, I marked the square on the door where I wanted the insert to sit. Using a large drill bit, I drilled into the door to get a hole. Then, I placed my jigsaw in the drilled out hole and cut the square out. *Tip: Make sure to cut the inside of the picture frame size out not the outside. You want to use the picture frame as your trim. Using tack nails, I nailed the frame onto each side of the door. Using a sanding pad, sand down the inside so there aren’t any jagged edges. Paint the frame and/or call it a day. There’s so many different ways of doing this project, you can easily make your own frame instead of buying picture frames. When I did this project, I was completely new to DIYing so I took the picture frame route. It worked great! Now that I have my feet wet, I would probably just make my own frame. Either way you decide to go, this project is simple and can be super cheap or free! *Here’s the door in the space today (2017). *Affiliate links below. Click to read my disclosure policy. Thanks for supporting this blog!